Tagged Farm, Historic, Historic Vermont, Jenne Farm, Maple Syrup, Vermont Barn, Vermont Dairy Farm, Vermont Farm, Vermont History, Vermont Landscape, Vermont Landscapes, Vermont Maple Syrup, Winter, Winter in Vermont, Woodstock Vermont. Give it a week and there will be no more snow. It must have been a very good season! 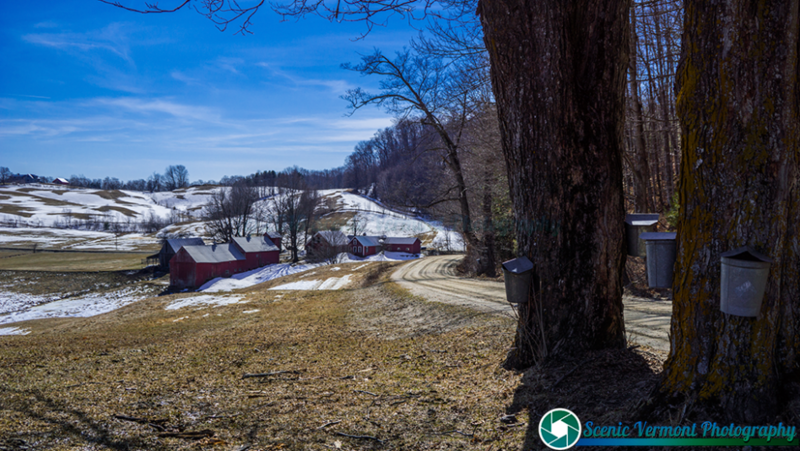 Scenic Vermont Photography Sugaring! I sure do miss it. Dolores Breen Sugaring season will be over very soon. If you are looking to buy some syrup, let me know. Scenic Vermont Photography Thank you… I live in NM, and friends just sent my yearly supply. But I’m delighted to know you sell and ship! Dolores Breen I personally don’t sell and ship but a good friend of mine who runs a sugarhouse sells and ships. I will make a note of that. Thanks! Yup… done that… many, many times… it’s a lot of work!!!! They have SO many trees… lot of walking and climbing up hills… But so worth it… Love maple syrup!!! !